Using inkjet technology for multi-function printers isn’t very cost effective, even if people like the quality of the output. Up till now the answer was laser or wax thermal printing, though both have corresponding limitations in color representation, speed and cost. What people needed was inkjet like results but laser speed and post of ownership, if those aren’t mutually exclusive demands. 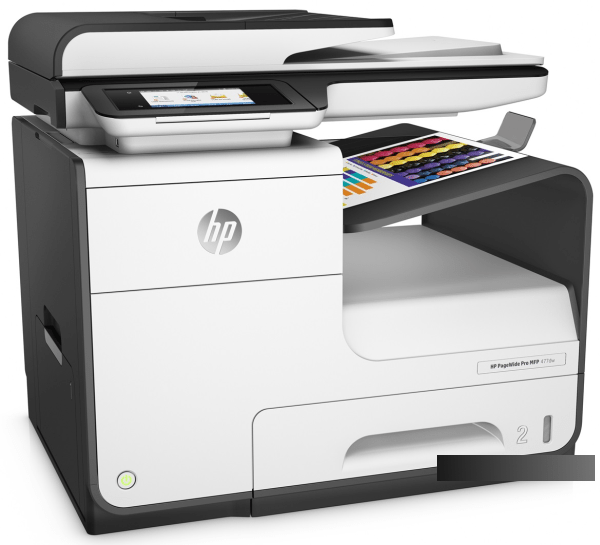 HP’s new HP PageWide Pro 477dw brings the usual scope of multi-function features and looks like a laser printer, but instead it uses a new inkjet technology called ‘PageWide’. The radical concept this introduces is a fixed ‘page wide’ head with no less than 42,240 nozzles delivering individual drops of just eight picolitres at ten meters per second. Printing at 1200dpi, and the system uses a four-cartridge CYMK model, and the swath of the output is 217.8 mm (8.575 inches) wide, handling the width of both US Legal, Letter A and European A4. So far, this tech has only been available on some of the Officejet Pro and Officejet Enterprise printers, but the new HP PageWide Pro 477dw now swells their ranks. 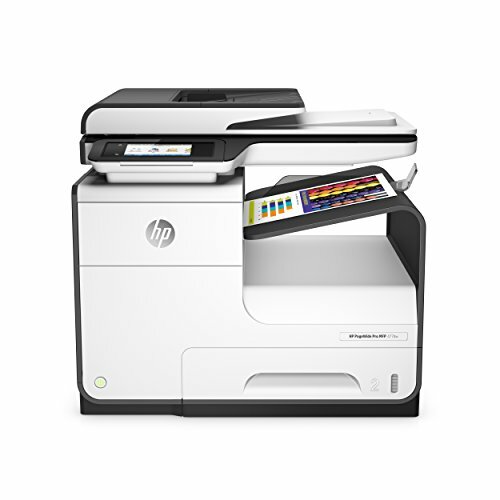 Compared with the HP Officejet Pro X476dw MFP that it replaces, the HP PageWide Pro 477dw is faster at printing and scanning, can accept higher yield cartridges and works with JetAdvantage Security Manager. 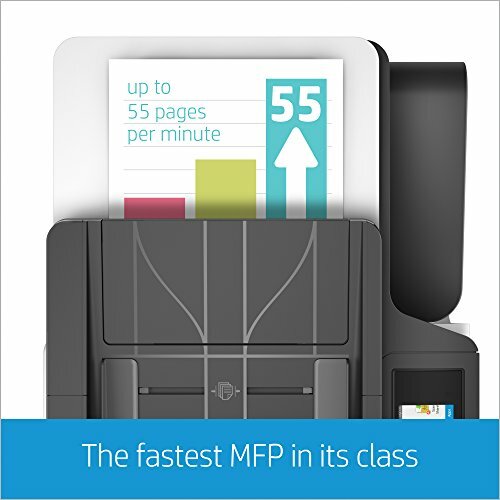 They’re both designed to be low-volume business printers (4,500 or less pages a month), but the HP PageWide Pro 477dw is perfect for those with a more mature IT infrastructure. 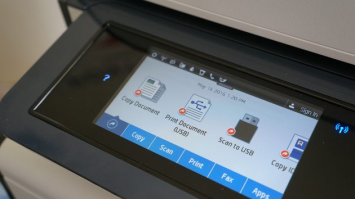 While the standard duty cycle might seem low, the maximum duty cycle for the printer is a whopping 50,000 pages a month. With most inkjets, that number wouldn’t be achievable, but using 55pm GO ‘General Office’ mode, it would take just 81 minutes to spew 4,500 5% coverage pages out. 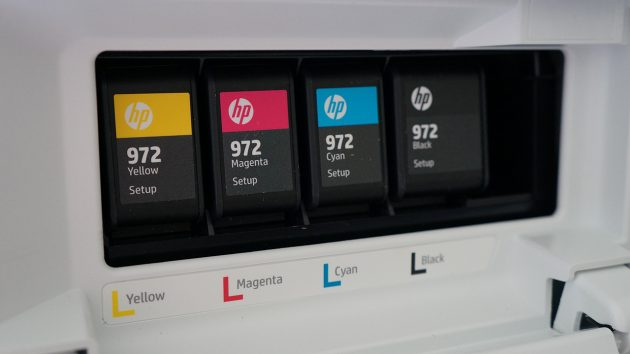 The ‘974X’ spec cartridges are rated for roughly 10,000 black pages at the usual 5% coverage, and 7,000 pages for the HP 973X color ones. As you might have guessed already, it doesn’t come with the high yield carts, but the ‘A’ variety that instead offer 3,000 black and 1,500 color pages respectively. That might seem on the steep side, but it works out at less than a penny for a mono page and about 3p for a color one, which is generally less than a color laser. That makes it substantially more frugal than many inkjets and faster, plus it produces higher quality output than most lasers. The only reservations I have about the print technology is that recently printed plain paper arrives a little damp and warped. This soon passes, but it’s not the same dry/warm handling experience of laser output. 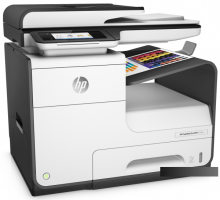 If you’ve owned HP laser printers before, you’ll expect the high build quality on offer here. This unit is built like something used for mining the Klondike, and it’s generally a pleasing fusion of form and function. The new page wide technology also produces less noise and emissions than laser, and the printer doesn’t induce a swaying motion in any table that isn’t perfectly rigid. 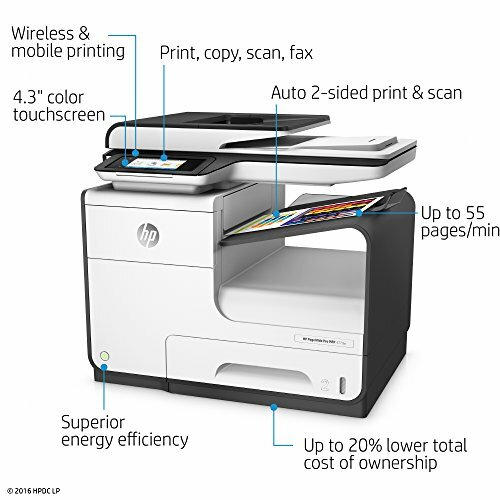 Paper handling is a single 500-sheet bin and a manual side loading tray, a;though HP accessories with an additional single 500-sheet tray and dual 500-sheet bins incorporating a floor stand. The only downside I can see with either of these options is that the output platform can only handle about 300 pages, so any print run greater than that number would always involves manual intervention. However, there are some aspects to this design you need to be warned about. For a start, at 51 pounds (23kg) this is a heavy old beast. Those with a history of back problems, you’ve been warned! Also, don’t assume that getting it ready to print will take minutes. 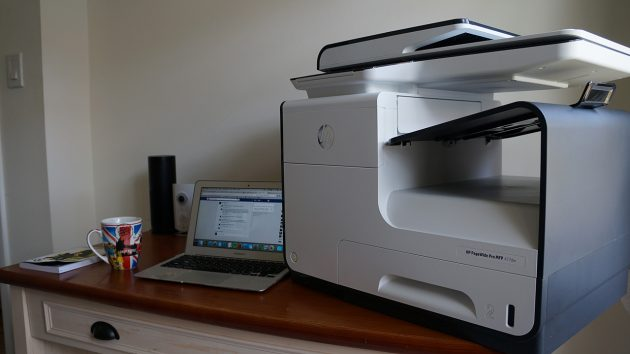 Not only did HP apply more adhesive tape to this printer than any other I’ve seen, but the setup routine prints no less than eight pages, some with 50% ink coverage. Once through those hoops, and once you’ve set the networking up, either with a cable or wifi password, then you’re good to go. 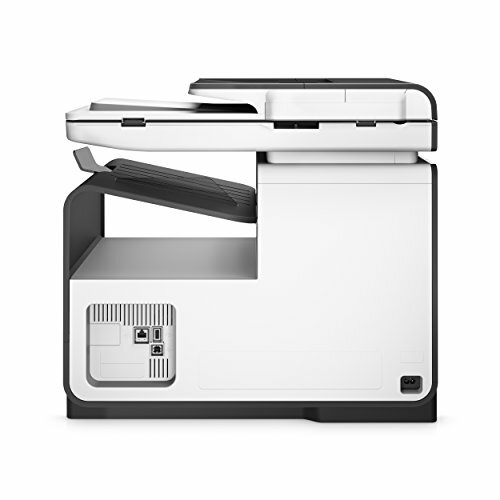 A definite treat is the scale of the color touch panel, because it allows the printer to play videos to you to explain a feature or process. 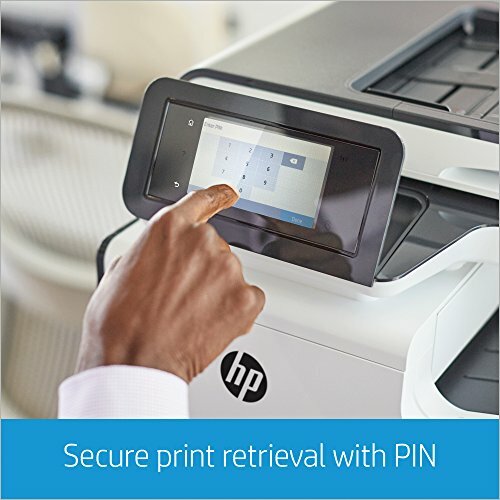 At the top level, the touch menu allows you to initiate the usual copy/scan/fax functions, along with print from and scan to USB. If you dig deeper into the menu structure, you can do all manner of things like scanning to network folders or SharePoint, in a very friendly big IT-friendly way. Overall, for those who want color output for a team of ten people or less, this is an excellent choice and a much better option than a color laser. Office printer with impressive new Pagewide inkjet technology.